Clevedon Community Bookshop was delighted to host a talk by Jane Duffus, author and journalist, who shared selected stories taken from her recently published book, The Women Who Built Bristol 1184 -2018 to a packed audience. Jane gave a lively account of some very remarkable and inspiring Bristol women, including less-well known figures such as pin makers, factory workers and workhouse inmates; and the more recognisable such as suffragettes; educationalists and doctors. All the women featured in the book have in some way helped to shape Bristol, and the lives we live today. Celebrating Portishead Open Air Pool, a fully illustrated history written by John Birkinshaw of Portishead Pool Community Trust, will be published on Friday 16 November by Clevedon Community Press, the Publishing Press of Clevedon Community Bookshop Co-operative. Its retail price is £9.95. This third publication from Clevedon Community Press charts the history of the open air pool from when the suggestion that it should be built was first mooted in 1924 through to its opening by Portishead Urban District Council in 1962, and onto the present day. Fully illustrated in both black & white and colour, Celebrating Portishead Open Air Pool includes many anecdotes and memories from people involved in building the Pool and in its subsequent life, as well as information and extracts from official records such as council minutes. In 2008, after several years of poor attendances and general decline, the Pool was in danger that it might close and be demolished. A local campaign STOP (save the open air pool) led to the establishment of Portishead Pool Community Trust and today, ten years later, Celebrating Portishead Open Air Pool marks the success of the Pool, this year attracting a record of more than 53,000 visitors. This well researched publication will be of considerable interest to residents of North Somerset, visitors to the area and, more widely, to local historians and those involved in the increasingly popular world of lidos and open air swimming. Clevedon Community Bookshop Co-operative and Portishead Pool Community Trust, two ‘not-for-profit’ local organizations, have worked together in publishing Celebrating Portishead Open Air Pool, thus contributing to documenting our rich history in North Somerset. Welcome to Clevedon Community Bookshop. This an exciting community enterprise in Clevedon. 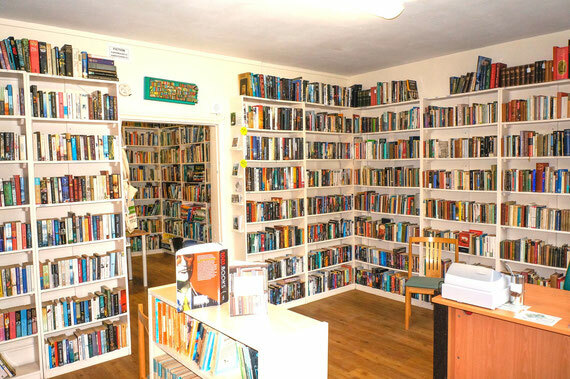 For 14 years a small second-hand bookshop existed in Copse Road, Clevedon. The new shop is the original shop plus the one next door, enabling us to double the area. We bought 7,000 books to sell in the newly refurbished shop and started trading on the 31 December 2011. The shop is now owned and run by people in the Clevedon area and by others committed to our objectives. We receive and sell good donated second-hand books, we also sell some new books. Our range of other items for sale include cards, gift vouchers, book-markers and cloth bags. Other activities are hosted in the shop such as; literary events, story reading for children, creative writing courses, poetry reading sessions. To check out our previous displays, head over to the Window Dressing Hub section on our Volunteer page.